Black 1 is one further than the large monkey jump at a. Unlike the monkey jump, it is not connected. White can cut it off with any of the marked moves. I don't think this has an official name, but I've heared it being called 'gorilla' once (being an even larger primate than a monkey). Charles Yes, this is quite often called a gorilla jump in English; though perhaps it doesn't add much to one's strength to have a name for it. The gorilla is connected in this position. In general, it is connected if is present, and there is no white stone at a (or at any of the first and second line points between the black stones and ). Is this large jump on the second line connected too? -- CeeBee? Bill: Looks like ko to me. Charles Matthews Perhaps it is pompous to raise this matter on this page, but there is an interesting question about not playing the monkey jump in the endgame, when jumping into a big open space. 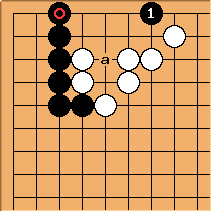 For example it is sometimes correct to jump to Black 1, or play a, rather than play b, when White has a really big potential territory with an open skirt. I don't know what rules one can give (this matter has been raised before somewhere on SL). I certainly have the feeling that when is correct, the plays around here are very large and may occur in the middle game. One reason to jump in on the second line is that with another play such as here Black can take away more territory, and also start to make some points. Obviously if Black starts to make points inside what was White's territory, the later plays around here have even more value. Therefore the presence of a white stone such as can make a big difference to what Black chooses to play here in the oyose stage. 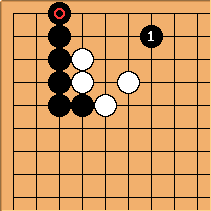 It seems to be one of Black's good options in this position to turn at instead. 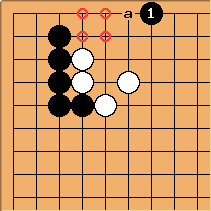 But if White answers directly at a and there is no good aji for Black such as the clamp at b, this seems to be smaller than Black directly at c. The advantage would have to be that it was more sente (bigger follow-up)?